When Brendan Murphy faced the prospect of choosing his individual graduate challenge — a prerequisite for all seniors at Hinesburg's Champlain Valley Union High School — he suggested perfecting a recipe for barbecued pulled pork. His father was underwhelmed by the idea. 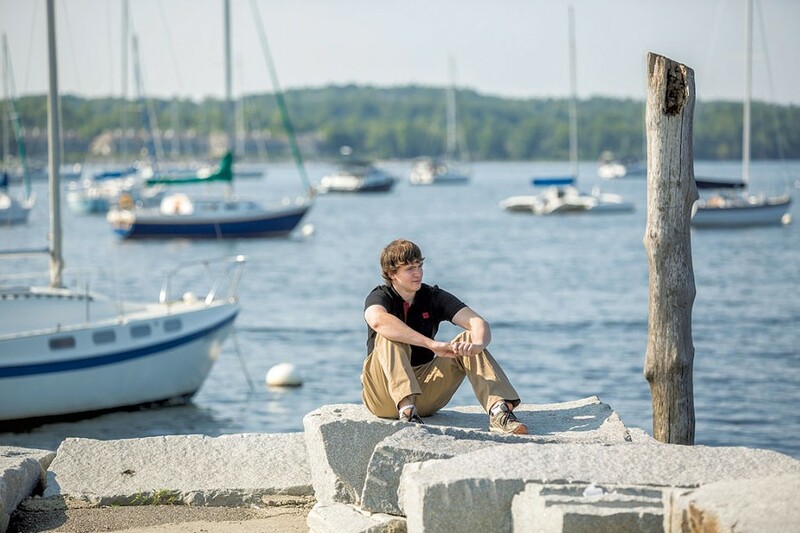 As other CVU students were learning new musical instruments and volunteering with local nonprofits for their senior projects, Murphy's dad, Liam, urged his son to take on something "a little more ambitious," especially because his college applications were on the line. The younger Murphy rose to the challenge. A few months after embarking on the project, he presented the findings of his research on Lake Champlain's changing water levels not just to his fellow CVU students, faculty and parents, but also to members of the Vermont Geological Society. Some of them were keenly interested in the young man's work. Murphy demonstrated what many Vermonters living along the lake have casually observed for years, but no researcher had quantified in four decades: The water levels of Lake Champlain — including its average lows and highs and its mean — are higher than previous measurements would suggest. Since the early 1970s, the lake has been slowly but steadily rising. It's easy to jump to the conclusion that global warming is to blame, but Murphy suggests that climate change actually plays a modest role at best. He theorizes that a "confluence of factors," both natural and related to human activity, are causing the lake to rise. Those factors range from the retreat of the glaciers beginning 15,000 years ago to the proliferation of new roads, parking lots and other impermeable surfaces that speed the flow of rivers and streams. Murphy's findings, which he detailed in his senior paper, "Lake Champlain Has Risen! An Update of the Mean Water Levels of Lake Champlain," have significant implications for developers, realtors, insurance underwriters and waterfront homeowners. People in the last group have legal title to their property down to the "low water" line. As Murphy explains in the paper, because the jurisdiction of many state and federal laws is based on the lake's mean water level, "If there is any significant change to the levels of the lake, [then] there is an effect on the ownership of property on the lake shore and an impact on the scope of regulatory programs on lake shore properties." Jurij Homziak, assistant professor at the University of Vermont and director of outreach and education for UVM's Lake Camplain Sea Grant, points out that a rising lake is also significant to the Army Corps of Engineers, emergency planners and others who work on flood-control measures on the lake and the Richelieu River to the north. For more than 40 years, Murphy explains, the legal yardstick for gauging Lake Champlain's average water line has been based on a June 1971 study published by Richard Downer, a now-retired professor of civil and environmental engineering at the University of Vermont. For that report, Downer analyzed 63 years' worth of measurements taken on the Burlington waterfront, from 1907 to 1971. Based on Downer's calculations — done in part to help clarify a 1967 Vermont Supreme Court ruling on contested waterfront-property rights in Chittenden County — Vermont's Water Resources Panel of the Natural Resources Board established the mean water level of Lake Champlain at 95.5 feet above sea level. That legal standard, set in 1972, is still used today. But, Murphy points out, many in Vermont's hydrological community have long suspected that the 95.5-foot level no longer reflects the lake's true norm. So, at the urging of his father — a Burlington-based real estate attorney who occasionally deals with waterfront-property and zoning issues — Murphy set out to replicate Downer's original study and see whether lake levels had remained constant. The high school student had several distinct advantages over his UVM predecessor. Downer and one of his students did all their serious number crunching on an old IBM mainframe computer, laboriously entering the data by hand on punch cards. The calculations alone took hours to process. By contrast, Murphy had the computational muscle of a 21st-century laptop at his disposal. As a result, his analyses could include not only annual high- and low-water readings but daily readings, all downloaded, recorded and compiled from the U.S. Geological Survey. He could tally nearly 40,000 data points in seconds. The result? For one thing, Murphy discovered that Downer underestimated the pre-1971 lake level in his original study by a few tenths of a foot. (The discrepancy can be attributed to Murphy's greater pool of data.) More importantly, he discovered that, since Downer's 1971 study, the average water level of Lake Champlain has "increased significantly" — by almost a foot. In the 63 years prior to 1971, the highest water level ever recorded on Lake Champlain was 101.51 feet. Since '71, Murphy found, that high-water mark has been surpassed 58 times. The new record high of 103.19, recorded during the spring floods of 2011, is nearly two feet higher than the pre-1971 record high. "There's obviously something that's going on to drive this," Murphy suggests. "You would not observe shifts that dramatic if something hadn't happened." So what is the driving force, if not climate change? Murphy readily admits that formulating and proving a hypothesis was well beyond the scope of his paper. However, with help from Homziak, a marine-sciences expert, Murphy offered up several possible theories. In the early '70s, Murphy says, the Canadian government narrowed the Chambly Canal, which lies approximately 30 miles north of the northerly end of Lake Champlain. He suggests this "bottleneck" restricts the northerly flow of the river, causing the lake to drain more slowly and thereby raising the lake level. Downer himself later proffered another potential explanation. Murphy didn't contact the retired professor when he began his project because, as he sheepishly admits, "I didn't even know he was still alive." Downer, now 75, works for the Federal Emergency Management Agency. He suggests that a cause of the rising lake could be what's known as "isostatic rebound." For thousands of years, Downer says, the glaciers that covered what's now the Champlain Valley basin were several miles thick and compressed the earth, "much as you'd compress your mattress when you sit on it." Even after the glaciers' retreat, land takes thousands of years to spring back into place. Because the Champlain Valley's glaciers receded north, the earth rebounded from the south end of the lake first. Hence, Downer says, "We are still now undergoing small amounts of isostatic rebound at the northern end of the lake." As the northern lake bed rises, he says, so does the water level. How did Downer feel about a 19-year-old revisiting the study he conducted 43 years earlier — and pointing out minor statistical discrepancies? "I'm flattered, in a way," Downer says. "You could say that that was my job for 34 years [at UVM], to encourage young people to ask questions and do these kinds of calculations." Downer admits he has a couple of quibbles with Murphy's conclusions, including his assertion that the lake has risen "significantly." "As I looked at Brendan's data, I felt he may have gone a little too far in his conclusions," he says. A bit of youthful exuberance? "There might be." Nevertheless, in April Murphy was invited to present his findings to the Vermont Geological Society, an honor usually afforded to college students. Afterward, he was approached by several professors who commended him on his work and said they'd like to examine the issue in more detail. Homziak, who attended the presentation, describes Murphy's methods as "sound," and says he performed a "rigorous statistical analysis" that was well-received by the experts in the room. In fact, Homziak later suggested that Murphy try to get his work published in a peer-reviewed academic journal. None of the attendees challenged Murphy's conclusions, though the high schooler says one professor offered yet another theory to account for Lake Champlain's rise: increased aquatic plant life in the lake and river, which slows the water's northerly flow. Later this month, Murphy will begin college at the University of Wisconsin–Madison, where he'll study economics with a statistical focus. As for perfecting that pulled-pork recipe, Murphy says he'll find plenty of time to work on that, too. He's heard Madison has quite the barbecue smoking scene. The original print version of this article was headlined "High Water Marks"